The Farm Bill opens a raft of opportunities for would-be hemp cultivators, including marijuana growers and smaller, traditional crop farmers. But doing it well requires shrewd planning and savvy dealmaking. Ask for payment up front when making a deal to cultivate on behalf of another business, such as a processor or a manufacturer of products like hemp lotions or CBD oils. Research who you’re buying your seeds from and where they’re coming from. You want to avoid being duped into buying marijuana seeds or another undesirable type of seed. Follow the wine industry’s lead and market your hemp with a focus on terroir, emphasizing how factors such as climate and soil can affect the quality of the plant. Be aware that growing acres of hemp is labor intensive and will require more employees than the typical agricultural or marijuana cultivation operation. Instead of shelling out big bucks to start a large operation, begin small so that mistakes won’t sink your business. 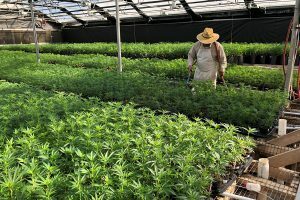 Sharp recommends that a hemp grower who contracts with a processor first secure – in writing – that the processor will pay at least $1,000 an acre for the crop. Next, get that money up front. If the customer isn’t going to provide you with the genetics – either seeds or clones – then add that to the per acre cost. Seeds can cost up to 80 cents apiece and clones around $4 per plant. Also, work out a deal to get a “kicker,” where, for example, you receive an additional bonus of $1.50 per pound per 1% of CBD produced. If you’re contracted for $4.50 per pound for a CBD content of 3% but your plants come back at 4%, you should get an additional $1.50 per pound – for a total of $6 per pound. Make sure to get that in writing before your crop leaves the field. Would-be hemp growers also need to be wary when securing seeds for their crops. In short, you want to avoid getting scammed. Seeds that are male rather than female. Female seeds create the flowers that hemp cultivators want; male seeds, by contrast, produce seed pods. Seeds that are, in fact, marijuana, with a high THC content. Joe Frey, co-owner of Western States Hemp, a cultivation operation in Fallon, Nevada, sidesteps getting conned by making sure he knows the seller through a first- or second-hand source, such as a trusted business contact. He also knows that a quality, high-CBD seed should cost 50-80 cents. “I’ve shied away from any deals that seemed too good to be true,” Frey said. A good alternative if you can’t trust your seed seller is to plant clones sourced from a well-established, reputable nursery. For comparison’s sake: Frey planted a crop with seeds at 80 cents apiece, with an 80% germination rate, and removed about half the male plants. He estimated his cost per plant, with labor included, totaled up to $6 per plant. He also planted a field with clones that he purchased for $4 each and lost less than 5% when he transplanted them. Moreover, the consistency he achieved with the clones created a denser canopy, thereby naturally controlling weeds and cutting down on labor costs. As the field of hemp growers gets more crowded, one way to differentiate yourself is to highlight the unique qualities of the region where you’re growing. Consider it similar to what the wine industry calls terroir – the taste and flavor given a wine by the environment in which it is produced. And be aware that hempseeds sourced in other regions may not perform well in your region if the climate is dramatically different. As wholesale prices for marijuana slide downward, more recreational MJ cultivators in states such as Oregon are pivoting to hemp production. The phenomenon, which was occurring even before the Farm Bill’s passage, allows marijuana growers to diversify their crop and reduce risk. In Oregon, marijuana farmers have a number of incentives for making the pivot. In the case of hemp, the state doesn’t have the same rules limiting how much growers can cultivate. Hemp cultivators also don’t face the high licensing and application costs seen with marijuana. Plus, the cost of production is much lower. You’re growing outdoors, for one, with far less energy costs than an indoor cannabis cultivation operation. For hemp, you’re looking at a cost of about $5 per pound; with marijuana, it’s about $300 more per pound. But if you are planning to diversify into hemp, avoid taking on too much land, at least initially, Sharp advised. It’s easy to underestimate the labor needs for an acre of hemp. Commercial hemp farming equipment is slim to none, and planting, weeding and harvesting hemp farms requires a lot of manual labor. During planting and harvest, Frey estimates he needs about two workers per acre. The rest of the year, he employs one person for every two acres. Bart Schaneman can be reached at [email protected]. Constructive criticism- Prices, implied yield from price per acre & worker needs are inaccurate for production at scale. The seed vs clone cost comparison may be correct for that individual producer but is not representative for the bulk of the industry that uses machinery to plant. It would be nice if Hemp Industry Daily would utilize people with broad experience in hemp industry for content or at least use us to fact check. I think we can all agree accurate information is critical for people considering entering the industry.